FAIRBORN — It’s a great idea — using 3-D technology for aerial refueling, a delicate and dangerous operation. The problem is that stereoscopic displays can potentially cause eyestrain, nausea and even misperception among the refueling operators as they try to align the two aircraft and avoid mid-air collisions. The issue was the focus of research by John McIntire, an alumnus of the Wright State University Human Factors Psychology Doctoral Program who recently won the prestigious 2015 Stanley N. Roscoe Award for best doctoral dissertation in a research area related to the field of aerospace human factors. 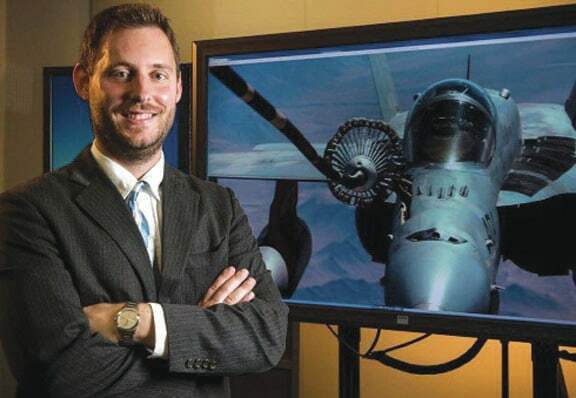 McIntire, who obtained his Ph.D. in psychology at Wright State in 2014, is an engineering research psychologist at the Battlespace Visualization Branch of the Air Force Research Laboratory’s (AFRL) 711th Human Performance Wing at Wright-Patterson Air Force Base. Roscoe, who died in 2007, was known for pioneering the application of flight and simulator experiments in the design of flight controls and displays at the Hughes Aircraft Company as well as contributing to the designs of the Northrop F-89, the Convair F-102 and F-106 and the Lockheed YF-12 airplanes and the TOW missile manual control system. The award is given in his name by the Aerospace Human Factors Association. At Wright-Patterson, McIntire studies and develops expertise in 3-D displays and 3-D perception for military application. Colorful, high-resolution displays are used to visualize and make sense of complex sets of data, which can be overwhelming and result in information overload. But McIntire says an estimated 25 percent of people who view 3-D displays experience discomfort or are affected in some negative way. One of McIntire’s dissertation research subjects passed a typical eye test but lacked depth perception when viewing 3-D. Another subject could see 3-D normally but could not use the information to improve performance. “This research is one of the first comprehensive set of experiments studying this question of individualized predictability of spatial task performance from binocular vision optometrics as relates to stereoscopic displays in aviation and USAF-relevant tasks,” AFRL adviser Paul Havig wrote in nominating McIntire for the award. Instead of looking out of the tanker’s window to line up the aircraft for refueling, operators are now doing it by sitting in front of a computer screen with 3-D glasses. Aerial refueling is the process of transferring fuel from a tanker plane to another military aircraft so the plane can remain airborne longer and extend its range. Refueling was used extensively during the war in Iraq. The tanker and receiver aircraft rendezvous while flying in formation. Fuel is pumped through a boom, and the pilots must precisely maintain their flight paths and speed or risk a mid-air collision or damage to the boom. Stereoscopic displays are also being considered in remote operation of bomb disposal robots. The son of a computer-scientist father, McIntire grew up in the Dayton area, graduating from Archbishop Alter High School. He became interested in psychology thanks in part to Steven Pinker, an experimental psychologist and popular science author known for his advocacy of evolutionary psychology and the computational theory of the mind. After obtaining his bachelor’s degree in psychology from the University of Dayton, McIntire came to Wright State in 2005 as a graduate student. He got his master’s degree in psychology, producing a thesis on the use of sound to help military pilots identify targets and threats. McIntire said Wright State gave him skills in experimental design, statistical analysis, critical thinking, literature reviews — all of which complement and supplement the expertise of his engineer co-workers. “We can really accomplish a lot more than either can alone,” he said. Portions of McIntire’s dissertation research have been published in Optical Engineering’s special issue on human vision and in an article in the Journal of Display Technology’s special issue on 3-D displays and visualization. The literature review that McIntire conducted in preparation for his dissertation was published in the journal Displays, and that paper was ranked among the Top 10 on ScienceDirect’s Top 25 Hottest Papers in 2014. McIntire is continuing his collaborations with the research optometrists at the USAF School of Aerospace Medicine and will conduct future research into binocular eye tracking for 3-D displays, binocular optometrics, tracking and interaction with 3-D data and visual performance modeling.